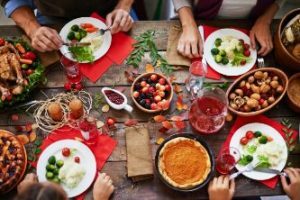 A Dentist In Houston Gives You 5 Holiday Tips For a Healthy Smile! During the holiday season, the last thing you’re probably thinking about is your teeth. But did you know that almost 1/3 of American adults have undiagnosed cavities? Since no one wants to spend their holidays getting dental work, it’s worth it to take some easy steps to prevent tooth decay and keep your smile healthy. And with all the extra candy, desserts and other sweet treats around, it’s extra important to make sure you’re not putting your teeth at risk. Keep reading for 5 easy things you can do during the holidays to enjoy yourself – without needing dental work from a dentist in Houston! The holidays are a prime time for travel, which can easily disrupt your oral hygiene routine. First, it’s helpful to pick up some travel sizes of your favorite products, including a fluoride mouthwash to strengthen your teeth and prevent decay. It can be easy to forget your toothbrush and floss because you’ll be using it on the day of travel, so you might consider getting an extra travel set and leaving your usual hygiene tools at home. Finally, pack some low-sugar, tooth-friendly snacks like nuts, string cheese, and beef jerky. When it comes to the “cavity equation,” it’s not only the amount of sugar you eat, but also the frequency that makes a difference. And when the house is filled with sweet things like eggnog and cookies, it’s easy to graze by sipping and nibbling throughout the day. It’s helpful to remember the phrase, “Sip all day, get decay” to remind yourself to consume sweet foods and beverages in one sitting rather than grazing on them. Always keep sugar-free gum on hand for those times when you eat a meal or snack and can’t brush and floss. It’s a great, on-the-go way to reduce the risk of cavities because it stimulates salivary flow and neutralizes the acids that cause cavities. When you’re eating more sweets than usual, it’s extra important to brush and floss well. Brush for 2 minutes, twice a day and floss once. If it’s hard for you to get it done before bedtime, try doing it right after dinner instead. This is also a great way to discourage nighttime snacking! Scheduling a checkup and cleaning is a chance for everyone in the family to make sure they don’t have any undiagnosed cavities and help prevent any existing issues from getting bigger. You can also get a professional fluoride treatment to strengthen your teeth. With these 5 tips for maintaining a healthy smile, you’ll be on your way to having a holiday season full of smiles! Before becoming a dentist in Houston, Dr. Holly Boone was both a dental assistant and dental hygienist. With a passion for dentistry that spans many years, she always focuses on prevention to help her patients stay cavity-free so their holiday season can be happy and healthy. If you have any questions about good oral health during the holidays, she can be reached via her website or at (713) 522-7540. Comments Off on A Dentist In Houston Gives You 5 Holiday Tips For a Healthy Smile!